Looking for a tool that designers and developers can agree on? 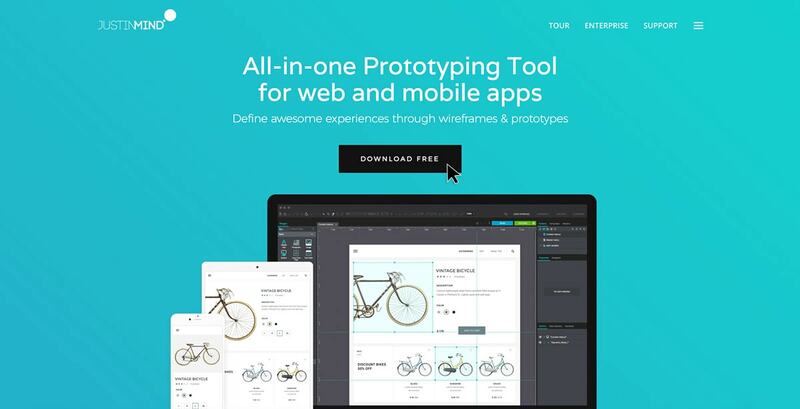 Justinmind is made for web and mobile app prototypes and Hi-Fi website wireframes. 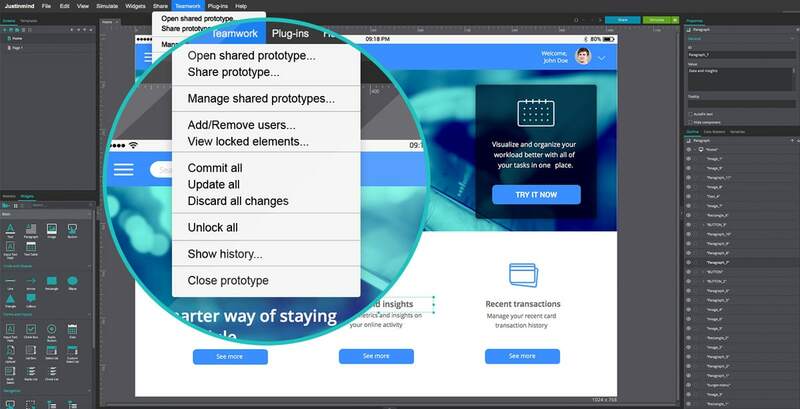 It has all the capabilities expected in prototyping tools such as resizing, drag and drop placement, formatting and more. In addition, it features a lot of goodies including widget libraries, reusable components, conditional logic, animations, calculations, simulations, and even prototyping simulation with actual data. It also comes with built-in collaboration tools, aimed at allowing designers and developers to work together. Anyone working in the digital ecosystem is aware of the communication gap. It exists between the business world and the software world on the outside and designers and developers on the inside. The need for a common language is obvious. The solution is not. Specification documents or diagrams are obsolete. Few people read them, and even fewer understand them. I’ve run into this issue countless times, and I’ve always improvised. Sometimes it worked, sometimes it didn’t. Most of the time, the communication gap resulted in hidden gaps and a lot of tension. Imagine this, an introvert leading a team of fully-fledged extroverts and coffee drinkers. World, meet my friends and dearest colleagues. Just to give you an even better idea, when they are not busy coding, designing and shooting at each other in some 3D shooter game, they are planning a trip to Antarctica. Can Designers and Developers Get Along? Keep the team together. Don’t keep the design team on the rooftop and the developer team in the basement. Keep them together. Build a project team. Let them work side by side. For remote teams, keep a playground where they can share ideas and experiences. Establish common design and development process. At any given time, design elements and code can be combined into a working prototype. Of course, you shouldn’t hesitate to let designers run a few iterations further on down the line. Keep them talking. Make sure that all your team members are constantly exchanging feedback and progress reports. Build a relationship based on peer review. Establish common goals. Implement an inclusive timeline where project milestones are reached together. Use the right tools. Use a common pool of collaboration tools, libraries of elements, frameworks, etc. that everyone is comfortable working with. Use the right tool, at the right moment. The last point is where I’ve failed my team. My usual toolkit, consisting of a projectpedia, a forum, versioning control, etc., was the weak link. And then came a revelation. One of our designers shocked us with a prototype that felt like the real thing. On a close inspection, he proudly showcased Justinmind. I am an explorer. I always explore new tools. It’s part of my job. It’s part of who I am. Justinmind was my favorite tool back then when I was just fiddling around with prototyping. It was the tool that allowed me to polish my skills, and jumpstart my career in digital. Somewhere along the line, Justinmind fell off my radar. And I lost a lot. Now, Justinmind is in an eighth version. And it comes with some amazing collaboration features. And that’s exactly what I needed. Justinmind is one of the best tools for designing and building interactive prototypes and wireframes which developers and clients will love. It’s easy to use and intuitive. 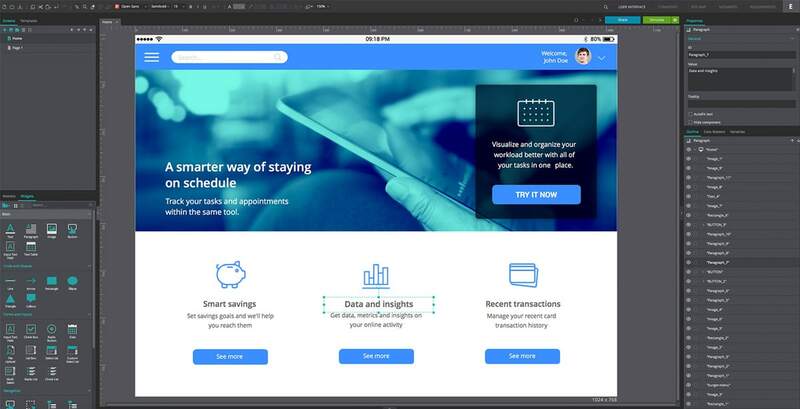 It’s designed to appeal to designers, and mimic the traditional tools they’ve got proficient in, but with a usability twist. Unlike my usual prototyping tool, Justinmind comes with a desktop app which is a significant advantage both regarding speed and productivity. Click and download. From there on, it’s drag and drop, tweak, refine, the way you want. A huge library of UI elements, a lot of customization options, style guides, and the awesome “Simulate” button will bring the Picasso from within any designer. And it’s not just simple designs where Justinmind excels. Building and simulating complex apps, for example, a shopping app with cart functionality, is limited only by your needs. Justinmind manages to shift the prototyping paradigm from a “designer exclusive” workflow to an inclusive paradigm, where developers are not only code scribes but also creators and contributors. What is it that makes developers part of the product design and development cycle from definition to code? The read-only developer mode, allows developers to inspect and test designs, grab images and CSS styles including attributes such as width, height, font, element alignment, line height, and color and padding. Additionally, developers can download a precise copy of the design. In addition, they can comment, review, ask for clarification and even suggest new ideas by simply using the comment section, without a separate tool. 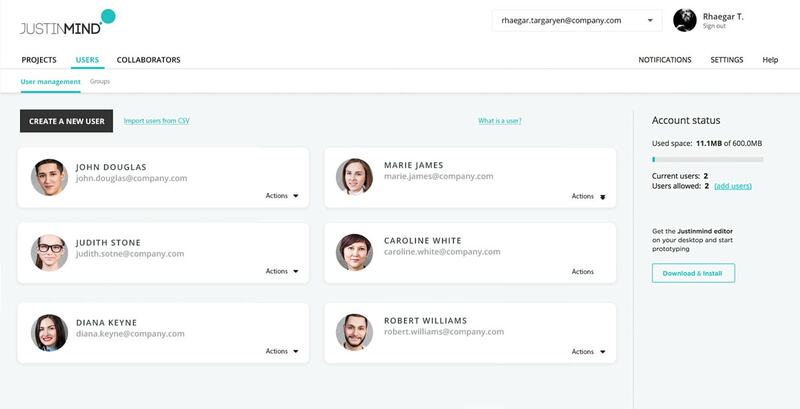 With Justinmind’s Teamwork features, leaders can manage all the team member involved with the product development including not only designers or developers but also any other relevant stakeholders. The built-in review system will keep everyone on track, and the commenting system will document each opinion. Each comment and piece of feedback can be tagged for solid management. Project managers will enjoy the robust management module that allows full control over repositories, users, permissions, roles and access levels. A version history is available at any time for every design. No more panic mode. You should also note that Justinmind works offline. Anyway, here is a detailed workflow for further reading. Justinmind works on Mac OS and Windows. Download a fully featured free version and test it out. Invite teammates, assign roles and start prototyping. Get the mobile apps, available for both Android and iOS, and keep your designs available at any time. No time for a new tool? Don’t worry, Justinmind has a smooth learning curve. Still, it’s a good idea to check out the user guide, but only to be sure that you aren’t missing any of the benefits that come along. 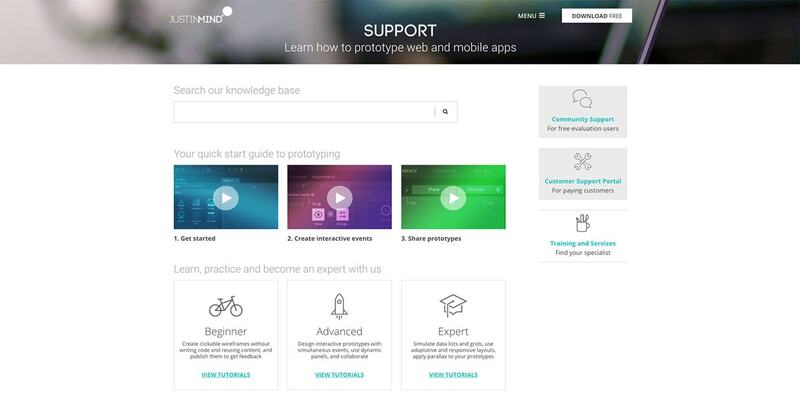 Furthermore, in addition to the comprehensive user guide, there are a lot of learning resources and video tutorials to help you get the most from Justinmind. By the way, don’t forget to hint to your corporate “overlord” about Justinmind’s enterprise features. You’ll make your life better. Trust me. Finally, have a look at what the team behind Justinmind has to say about their latest developments. It’s a nice read. However, the best way to experience Justinmind is to download the app and test the bundled in examples. In my case, this was more than enough. And, by the way, about my job … Things got better. Much better.